Rajko Zinzifov was born in Veles, in a famous Veles family. His father worked as teacher in a Hellenized school and raised under the influence of the Hellenic spirit, he gave his son a Greek name Xenofon (on Macedonian Rajko). Rajko Zinzifov finished primary school in Veles and later he goes to help his father in Prilep to work. 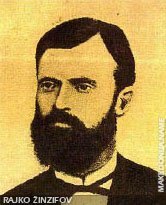 But soon in 1856, he gets under the influence of the Macedonian struggle for cultural revial, leaded in that period by Dimitar Miladinov. Together with Dimitar Miladinov, Rajko Zinzifov leaves Prilep and goes to Kukus (today Aegean Macedonia, Greek name Kilkis), where he works, to remove the Greek influence in the schools. In 1858 he leaves Macedonia, and goes to Russia in Odessa and in Moscow to study in a university. There Rajko Zinzifov, establishes connections with some Macedonian students and especially with Konstatin Miladinov. He takes active work into the party of the students from the Slavic regions under Turkish rule. In 1960 he becomes director of the magazine "Bratski Trud". In 1865 he finishes his studies. And in 1866 Rajko Zinzifov visits Macedonia, and he goes back again in Russia where he teaches to the end of his life. Rajko Zinzifov died in Moscow in 1877.